Dogs can help you get a date and look more attractive: The power of a Labrador puppy. Dogs really can help you find love. Step 1: Bring a dog. Step 2: Find love. This article was adapted from Brian Hare and Vanessa Woods’ The Genius of Dogs. When Melanie met a man she really liked, she wanted to get to know him better, but he was really shy. Not long after, Melanie’s new man plucked up the courage and asked her on a real date. They’ve been together for 28 years, and they still have dogs. Melanie was part of a survey within our citizen science project Dognition, which aims to help us understand the dog-human relationship. According to the survey, 82 percent of people would feel more confident approaching an attractive person if they had their dog with them. This is somewhat surprising. There has been a lot of research into the beneficial roles dogs play in promoting an active lifestyle, improving productivity at work, and even decreasing the risks of stress, heart attacks, and strokes—but our love lives? Research has shown that it’s notoriously difficult to get phone numbers from women this way. But Antoine found a surefire way to improve his chances—he brought along a dog, a lovable black mutt with undeniable charisma. The difference between Antoine and other Frenchmen fishing for phone numbers was that Antoine was part of a study by Nicolas Gueguen and Serge Ciccotti from the University of Bretange Sud in France exploring how dogs facilitated social interactions. Antoine approached 240 women over the course of the study. When he was alone, his success rate was around 1 in 10. But when the dog was present, his chances jumped to 1 in 3. Not bad at all. This puzzling phenomenon is present even in the 2-D world. One study asked participants to rate photos of people with or without a dog. The same photo models were judged as looking more relaxed, approachable, and happy when they appeared with a dog (all desirable characteristics for a profile picture for those on match.com). The research in this area is fairly conclusive. Random strangers, homeless people, and people in wheelchairs all find that when they have a dog with them, they are approached more and experience more positive interactions. Having a dog with you is more important for first impressions than what you wear. The kind of dog does make a difference—a Labrador on the end of your leash is more likely to get you more attention than a Rottweiler. (Unjust as this may be, someone ran the numbers and that’s just how it is.) In fact, if you’re really out to get attention, nothing does the job like a Labrador puppy. In fact, dogs have such an influence that women should beware. A 2013 study by Sigal Tifferet and colleagues from the Ruppin Academic Center in Israel found that men with wicked intentions can use a dog to their advantage. One hundred women were asked to read descriptions of two different men and rate which one they would be more likely to either have an affair with or marry. The men fell into one of two classic mating-strategy categories. They were either a “dad” type, meaning they were compassionate, romantic, and interested in long-term relationships and children. Or they were a “cad” type, dangerous, attractive, and all about the chase. The researchers found that while women generally said they would prefer to marry the dad types, women were more likely to want to marry a cad if he had a dog. In fact, the cad with a dog rated more highly than a dad with a dog. As to why this might be, the researchers proposed that in today’s society, a man having a dog signals that he has the resources and the willingness to care for someone else, even if other evidence of his mating behavior says otherwise. But whatever type you are or may be looking for, once you’ve shamelessly used your dog to catch the eye of the one you’re interested in—don’t stop there. 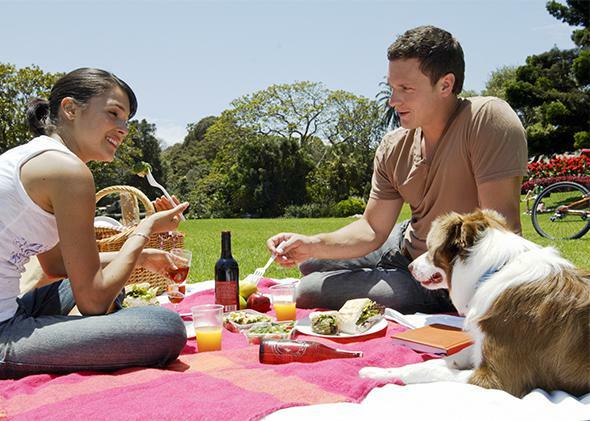 In the Dognition survey, 65 percent of people said their perfect date included their dog. Go fetch.